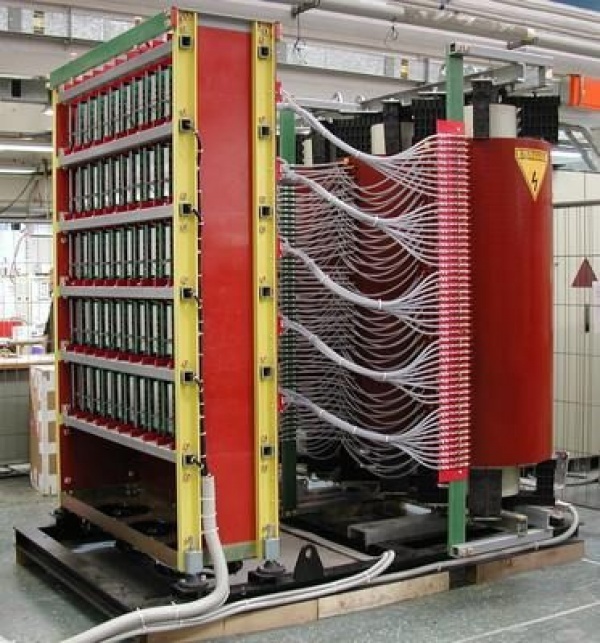 High Voltage Loads (such as tubes, RF generators, Gyrotrons, Tetrodes, Klystrons, IOTs. This high performance modulator is suitable for almost any high voltage application. Another advantage is the quick switch-off, which limits the total energy discharged in an arc to less than 1 (one) J, and which therefore protects the load in a very effective way. The topology is based on a modular structure with a large number of elementary IGBT-based power modules; with this solution the voltage can be modulated in a very fast way obtaining the desired output voltage by using a proper switching strategy. This modular structure is characterized by redundancy in order to increase the fault tolerance and the reliability of the system. The modular approach also improves maintenance and servicing, simplifies the managing of the spare parts and reduces the life-cycle cost of the installation. The solution is available for a wide range of power and can be easily redesigned for custom needs. In particular, this topology has been specifically implemented to drive the Body electrode of Depress Collector Gyrotrons and is installed in the European Electron Cyclotron Test Facility in Lausanne. The Modulator finely regulates the total beam voltage (sum of the cathode and body voltages) helping to reach the required total accuracy and to compensate the transients generated on the cathode voltage by the much larger Main High Voltage P.S.. Similar P.S.s have been delivered to FTU (Enea, Italy) and to JAEA (Japan).